As I understand it, today’s “grief counselors” encourage people to get over their grief from losing a loved one by putting the past behind them and living in the present. Less nicely put, it means pretty much forgetting the loved one as quickly as possible and getting on with life. Based on my survey of a number of websites dealing with grief counseling, the survival of the deceased loved one in another realm of existence is a taboo subject. If the grieving person brings it up, he or she should be referred to his or her pastor for guidance. But the “heaven” of orthodoxy usually seems more like a punishment than a reward, at most a very boring fantasy land, so that does little to mitigate the grief. Over some 80-plus years, I have seen many friends and relatives struggle with the grief that follows the death of a loved one, and it is not nearly as simple as the mental health “experts” who make up the grief counseling rules seem to want to make it. Underlying the grief of nearly all of those in deep despair at the loss of a loved one is what author August Goforth calls an “existential bleakness” – the inability to find any real meaning in death…or in life. Moreover, living in the present, as the grief counselors advise, so often unfolds as hedonism – eat, drink, and be merry. It involves escaping into seemingly meaningless and mundane activities in order to overcome it all and move on. Goforth’s recently released book, The Risen: A Companion to Grief, opposes the mainstream approach of avoiding talk about the survival of our loved ones. “Achieving awareness of our immortality will lift our minds above the temporary chaos of humankind and connect us with a greater reality that is infinite, and which means there is no final ending,” he explains, going on to say that we should be able to find comfort with grief rather than from it. In addition to being a New York psychotherapist, Goforth is also an intuitive-mental and psychophysical spirit medium who knows with certainty that this life is a small part of a much larger life and that we will be reunited with out loved ones again. There is no reason to bury them in the deep recesses of our mind as garden variety mental health experts would have us do. Once we have the conviction that we will see them again, we can overcome the grief by embracing them rather than by forgetting them. After reading Goforth’s 2009 book, The Risen, I had the opportunity to interview him for a publication I then edited. He informed me that Timothy Gray, a co-author of that earlier book as well as this book, was a New York City writer, editor and photographer who transitioned to the spirit world during the early 1990s, and then, about two years after his physical death, began communicating with him, providing his own experiences in the afterlife as well as information given to him by “The Risen Collective,” a group of more advanced spirit entities who use Timothy Gray to relay information to Goforth. As Goforth explains it, the members of the Risen Collective once lived on this Earth and much of what they advise comes from emotional states they experienced when incarnate as well as from emotional insights they have discovered in their present state of existence. As they see it, grief is not a problem to be solved; rather, it is a doorway that is meant to be passed through. The key to getting through that doorway, Goforth says, is to surrender. The old friend continued the reunion in a cheerful tone, and it seemed to Maeterlinck that her voice had grown younger. Maerterlinck said that he had heard of her sorrow and was about to offer his condolences when the friend interrupted him and said that “he is not dead.” Confused, Maerterlinck sought clarification. The old friend showed him a picture of her son’s grave and went on to explain that she had been in communication with her son since his battlefield death. 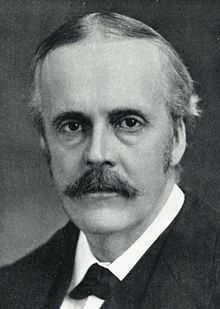 Arthur James Balfour (below) is most remembered as a British statesman, primarily as the Prime Minister of the United Kingdom from 1902 to 1905, but he is also remembered for one of the most intriguing love stories on record, one documented in what is called the Palm Sunday Case. With Valentine’s Day upon us, it seems like a good time to recall that case from the annals of psychical research as recorded in the archives of the Society for Psychical Research in England (SPR) and further discussed in some detail by Professor Archie Roy in his book The Eager Dead and by Professor David Fontana in Is There an Afterlife? The other half of the love story was Mary Catherine Lyttelton, who went by the name May. Arthur and May met at a ball at Hawarden Castle, the home of William Gladstone, then the Prime Minister of the United Kingdom, at Christmas time of 1871. May’s fiancé had recently died from tuberculosis and, although Arthur was immediately attracted to her, he hesitated to intrude upon her grief. They became close friends, however, and shared many interests over the next three years. It was not until about January of 1875 that Arthur declared his love for May. He had plans to propose marriage to her on his next visit when she died of typhus on March 21, 1875, Palm Sunday, at age 24. While Arthur lived another 55 years, transitioning in 1930 at age 83, he never married, and he is said to have spent every Palm Sunday visiting Lavinia, May’s sister, and her husband in a day of remembrance. As for May, Dame Edith Lyttelton, her sister-in-law, wrote: “Not an exceptional beauty, but love and sympathy streamed out from her. She was one of those people who charge the atmosphere with life when they appear.” She was said to be an accomplished pianist and enjoyed the musical evenings that were a big part of Victorian family life. She especially took delight in joining those who sang Handel’s oratorio songs or lighter pieces. During May’s final moments, Lavinia was present and later reported that during a delirious outburst, May imagined herself at the pre-Christmas Ball at the Gladstone’s house at Hawarden, where she first met Arthur. “Her fevered brain telescoped that meeting into a confused collage of memories. ‘Oh, he does interest me more and more…I do wish he had a little more backbone – perhaps it will come with age. He has so many good qualities but also such peculiarity…Oh to see him in a ballroom is a sight in itself.’”. To Lavinia, it was clear that May and Arthur were meant for each other. She saw that, in spite of his hesitancy to propose, his whole heart was May’s and that May was prepared to return his love. Most of the spirit communication came from deceased researchers, including Frederic Myers, Edmund Gurney, and Henry Sidgwick, the three men credited with founding the SPR, in what have become known as the “cross-correspondences” – various messages when pieced together resulted in a complete and sensible message. The purpose of this, it was explained, was to offer evidence that overcame the telepathy and superpsi theories often suggested to defeat spirit communication. May was cooperating with them in the experiment and found it difficult to make direct contact through Mrs. Willett. When Arthur received word of the communication, he was reluctant to sit with Mrs. Willett and very skeptical. However, at the urging of his brother, Gerald, he did visit Mrs. Willett and became convinced that it was indeed May who was communicating through her. Especially evidential was mention by May of a silver case that Arthur had made in which to keep a lock of her hair. May even cited the inscription on the case, taken from 1 Corinthians about the mortal putting on immortality. Reference was also made to a photo of May holding a candlestick which Arthur treasured. Arthur deemed it highly unlikely that Mrs. Willett would know anything about the silver case or the photo. On February 15, 1958, 28 years after Arthur’s death and two years after the death of Mrs. Willett, Geraldine Cummins, perhaps the most famous of automatic writing mediums, was receiving messages for a couple who had known Mrs. Willett and were familiar with the story of Arthur and May. Mrs. Willett told them through the hand of Miss Cummins that she had encountered a friend of Arthur’s on that side who was in contact with Arthur and May, who apparently were at a higher level than they were. “I am free to tell you of their intrinsic inviolable unity,” Mrs. Willett communicated. “They shared the one anti-self, while consciously separated by her early death. So many years parted after her passing. An emptiness, a dissatisfaction continually then for him. No joy. He merely put in time with hard and varied mental work. Such faithfulness, such patient waiting. Then at last, after sixty years, or fifty by the clock, the meeting at the other side of death when his old age dropped from him like a ragged garment. But oh! It was well worth while to wait so long for that event. If they had not been parted by her death, he would never have worked with that industry, that brilliance that made a name for him. Work was his escape from intolerable memory. Oh! He was so idle before she passed.